The book starts in the Summer of 1976. Robyn has spent the summer swimming and hanging out with her brother, Kit and their friends. Robyn is curious about the women and children her mother brings home, but when an angry man shows up at the door one day, Robyn is frightened. She hears people talking about her family, gossiping about her mother. She feels like everyone is keeping secrets from her and so what harm will come if she keeps some of her own? A stranger takes an interest in Robyn. She’s not frightened of him…although she knows she probably should be. She knows she should tell her mother about the Cowboy who says odd things and gives her little gifts. Who is this strange man? What does he want with Robyn? Something happens that summer….something that changes Robyn and her family’s life forever. Twelve years later (1988) Robyn and her brother have returned to town to find answers. Will they get the answers they seek? Or will they end up with more than they bargained for? This story alternates between 1976 and 1988. I found it easy to keep track of which timeframe I was reading. I thought the plot was good, but there were times things seemed to drag on a little. However, I was invested in the story and the characters, and I really wanted to see how it all played out. 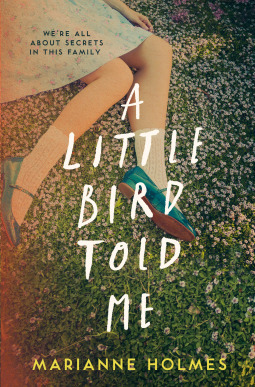 Overall, I enjoyed “A Little Bird Told Me”. It was a good debut novel. I’m interested in seeing what Marianne Holmes writes next. I’d like to thank Agora Books for giving me the opportunity to read this book in exchange for my honest review. Sounds like a great summer thriller that will keep you captivated.